An Leabhar Breac ('The Speckled Book'; c.1410) is a manuscript containing a collection of mostly religious material in both Latin and Irish, now housed in Dublin at the Royal Irish Academy. 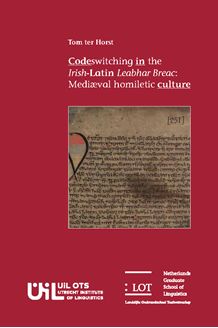 The present publication explores the make-up of the manuscript, focusing on the question which languages are used where and for which texts, and singling out individual texts which use a combination of languages within the same speech act, a process called codeswitching. Special attention is paid to the genre of the homily, a moral commentary on religious themes. The use of Latin and Irish in such texts can shed light on the intellectual culture of Ireland, an important centre of learning in mediaeval Europe. The Leabhar Breac manuscript is a composite piece of various sources, most of which date to about 1100, though some may be dated as late as 1350. By studying the languages of these texts, one can hypothesise about the languages and dates of their sources, and thus about the availability and level of Latin learning in Irish intellectual society through time. For this purpose it is important to study not only individual texts but also the quires in which they occur. The hierarchy and juxtaposition of texts and languages is an indication of their intended manner of composition, while the level of compositional ability on the part of the author or scribe is a reflection of bilingual education. Such a bilingual education can then be compared to similar circumstances such as Latin-English sermons in England.